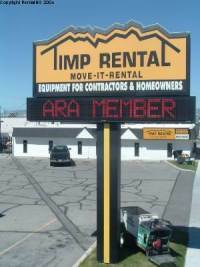 Timp Rental Center has been a family owned company since 1979. We take pride in our high quality equipment rentals and sales as well as moving rentals through Move-It Rental, Inc., our moving division. Timp Rental Center has the mission to be THE rental company of choice for homeowners, contractors, businesses, and government agencies in Orem UT, American Fork UT, Lehi UT and the Provo UT metro area. TRC will accomplish this vision by renting and selling highly maintained, reliable, safe, clean, products with an emphasis on friendly and fast service. In addition to our existing products and services, we will continue to introduce new and innovative products and services to provide the right equipment for the job. It is through these practices that Timp Rental Center will be THE rental company of choice.